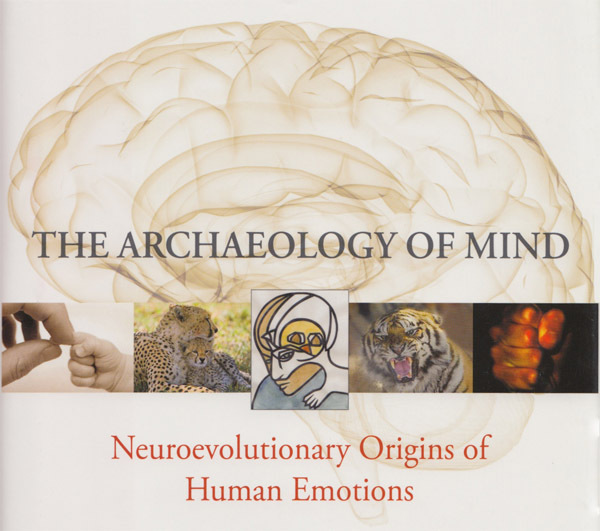 Jaak Panksepp has been researching human and mammal emotions his whole career, from his thesis "The Neural Basis of Aggression in the Albino Rat" to the devolpment of the theory of primary emotions. This book represents a lifetime's wisdom. 1. The SEEKING, or expectancy, system (discussed in Chapter 3) is characterized by a persistent exploratory inquisitiveness. This system engenders energetic forward locomotion-approach and engagement with the world-as an animal probes into the nooks and crannies of interesting places, objects, and events in ways that are characteristic of its species. This system holds a special place among emotional systems, because to some extent it plays a dynamic supporting role for all of the other emotions. When in the service of positive emotions, the SEEKING system engenders a sense of purpose, accompanied by feelings of interest ranging to euphoria. For example, when a mother feels the urge to nurture her offspring, the SEEKING system will motivate her to find food and shelter in order to provide this care. The SEEKING system also plays a role in negative emotions, for example, providing part of the impetus that prompts a frightened animal to find safety. It is not clear yet whether this system is merely involved in helping generate some of the behaviors of negative emotions, or whether it also contributes to negative feelings. For the time being, we assume it is largely the former, but that the positive psychological energy it engenders also tends to counteract negative feelings, such as those that occur during FEARful flight and the initial agitation of PANIC/GRIEF. For this reason, animals may actually find fleeing to be in part a positive activity, since it is on the most direct, albeit limited, path to survival. 2. The RAGE system (see Chapter 4), working in contrast to the SEEKING system, causes animals to propel their bodies toward offending objects, and they bite, scratch, and pound with their extremities. Rage is fundamentally a negative affect, but it can become a positive affect when it interacts with cognitive patterns, such as the experience of victory over one's opponents or the imposition of one's own will on others who one is able to control or subjugate. Pure RAGE itself does not entail such cognitive components, but in the mature multilayered mammalian brain (Fig 1.4), it surely does. 3. The FEAR system (see Chapter 5) generates a negative affective state from which all people and animals wish to escape. It engenders tension in the body and a shivery immobility at milder levels of arousal, which can intensify and burst forth into a dynamic flight pattern with chaotic projectile movement to get out of harm's way. 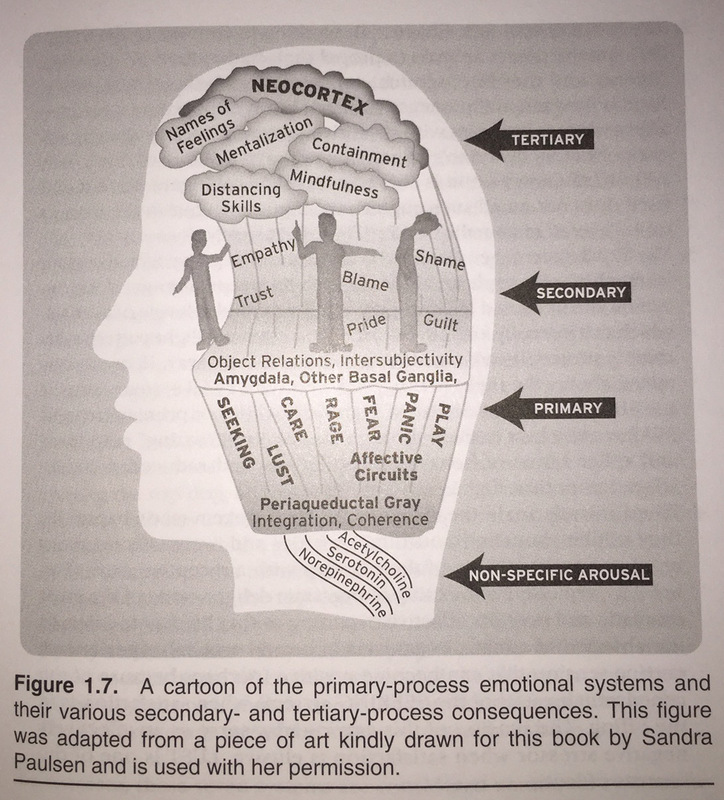 If, as we surmised above, the flight is triggered when the FEAR system arouses the SEEKING system, then the aversive qualities of primary-process FEAR may be best studied through immobility "freezing" responses and other forms of behavioral inhibition, and reduced positive-affect, rather than flight. 4. When animals are in the throes of the LUST system (see Chapter 7), they exhibit abundant "courting" activities and eventually move toward an urgent joining of their bodies with a receptive mate (Figure 7.1), typically culminating in orgasmic delight - one of the most dramatic and positive affective experiences that life has to offer. In the absence of a mate, organisms in sexual arousal experience a craving tension that can become positive (perhaps because of the concurrent arousal of the SEEKING system) when satisfaction is in the offing. The tension of this craving may serve as an affectively negative stressor when satisfaction is elusive. LUST is one of the sources of love. 5. When people and animals are aroused by the CARE system (see Chapter 8), they have the impulse to envelop loved ones with gentle caresses and tender ministrations. Without this system, taking care of the young would be a burden. instead, nurturing can be a profound reward - a positive, relaxed affective state that is treasured. CARE is another source of love. 6. When overwhelmed by the PANIC/GRIEF (also often termed "separation distress") system (see Chapter 9), one experiences a deep psychic wound an internal psychological experience of pain that has no obvious physical cause. Behaviorally, this system, especially in young mammals, is characterized by insistent crying and urgent attempts to reunite with caretakers, usually mothers. If reunion is not achieved, the baby or young child gradually begins to display sorrowful and despairing bodily postures that reflect the brain cascade from panic into a persistent depression. The PANIC/GRIEF system helps to facilitate positive social bonding (a secondary manifestation of this system), because social bonds alleviate this psychic pain and replace it with a sense of comfort and belonging (CAREfilled feelings). For this reason, children value and love the adults who look after them. When people and animals enjoy secure affectionate bonds, they display a relaxed sense of contentment. Fluctuations in these feelings are yet another source of love. 7. The PLAY system (see Chapter 10) is expressed in bouncy and bounding lightness of movement, where participants often poke - or rib - each other in rapidly alternating patterns. At times, PLAY resembles aggression, especially when PLAY takes the form of wrestling. But closer inspection of the behavior reveals that the movements of rough-and-tumble PLAY are different than any form of adult aggression. Furthermore, participants enjoy the activity. When children or animals play, they usually take turns at assuming dominant and submissive roles. In controlled experiments, we found that one animal gradually begins to win over the other (becoming the top dog, so to speak), but the play continues as long as the loser still has a chance to end up on top a certain percentage of the time. When both the top dog and the underdog accept this kind of handicapping, the participants continue to have fun and enjoy this social activity. If the top dog wants to win all the time, the behavior approaches bullying. As we will see in Chapter 10, even rats clearly indicate where they stand in playful activity with their emotional vocalizations: When they are denied the chance to win, their happy laughter-type sounds cease and emotional complaints begin. The PLAY system is one of the main sources of friendship. end quote - pages 34-37 with figure 1.7 in the middle.